CVGHM reported that seismicity from Batur decreased from 1 June to 17 November and fumarolic plumes rose from the crater. On 19 November the Alert level was lowered to Normal, or 1 (on a scale of 1-4). Batur stratovolcano sits at the E end of the island of Bali amid nested calderas (figure 4) and rises 686 m above the surface of an intra-caldera lake of the same name (Sutawidjaja, 2009). The entire complex remained non-eruptive through at least mid-2011 as it has for at least a decade (since a moderate eruption in 1974 and a series of smaller eruptions in the 1990s ceasing in about 2000). Local authorities reported that, following some variable seismicity during 2009-2010, starting 19 June 2011 residents smelled sulfurous gas and saw many dead fish floating on the lake's surface. 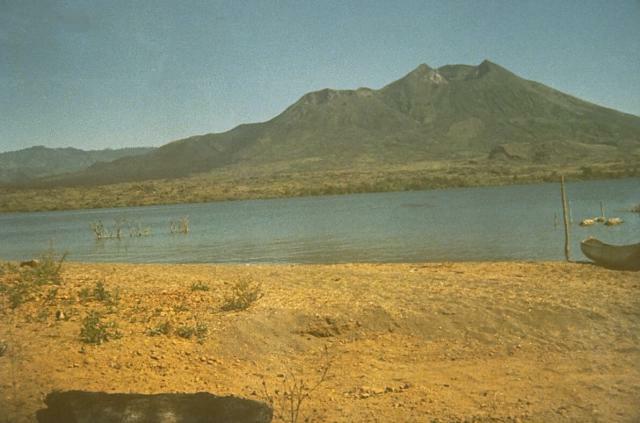 The kill took place in the volcano's caldera lake but in the absence of visible eruptive activity and without anomalous geophysical perturbations. Figure 4. Physiographic map of the island of Bali highlighting Batur caldera. The topographic high in the N-central caldera is Batur stratovolcano (summit elevation, 1,717 m). The lake (not delineated) lies along the caldera's SE side. Taken from Sutawidjaja (2009). Our previous report on Batur (BGVN 34:11) had noted increased seismicity from September to 7 November 2009. Since that report, the Center of Volcanology and Geological Hazard Mitigation (CVGHM) has reported that seismicity from Batur decreased from 1 June to 17 November 2010 and fumarolic plumes rose from the crater. On 19 November the Alert level was lowered to Normal, or 1. Investigation of thousands of dead fish. CVGHM scientists visited Lake Batur (figure 5) to learn more about the incident. They learned that residents of lakeside villages first observed lake water discoloration and acrid (like sulfur) odors on the morning of 19 June 2011. A greenish-white discoloration first emerged in spots, but these spots soon connected and spread. The residents had seen a slick on the water surface spread from the E-central lake shore towards the S (from Toya Bungkah to Buahan, figure 6). In conjunction with these changes in color, thousands of dead fish were found at the surface of the lake (figure 7). Figure 6. Map showing location of Lake Batur, with the locations of the greenish-white water seen near the coast (shaded). The lake is 7.7 km in the long dimension and has a surface area of 16 km2. Courtesy of CVGHM. Figure 7. Photo of dead fish floating on the surface of Lake Batur associated with the fish kill of 2011. Thousand of fish died, many near the village of Toya Bungkah. Undated photo taken from indosurflife.com. The translated report contained this important passage. "According to information from a resident (Made Yuni, age 59), the change in color of the lake water, consisting of patches of whitish green, is a yearly event, although [typically] small in scale and not causing the death of fish. The change in color of the lake water occurs during the change of seasons (i.e. the transition), between the wet and dry parts of the year when there is a stiff wind from the S. The incident of the lake water changing color and the death of the fish on 19 June 2011 occurred about two weeks into the dry season. The death of fish in Batur on the present scale happened before, in 1995." Scientists conducted an examination during 21-22 June 2011. They also had pre-event temperature and pH for multiple sites on the lake going back at least several months. At the time of the visit, all residual odors had dispersed. Results of ambient gas measurements showed no traces of anomalous carbon monoxide, carbon dioxide, methane, or hydrogen sulfide. The lake temperature was found to be 15°C, which is considered normal. pH levels in the lake were found to be constant with other measurements taken in normal times as well. No increase in volcanic earthquakes were reported before or after the fish kill (the pattern of earthquakes was constant at typical background, 1 event/day). The colors seen were attributed to both warm water welling up (springs at Toya Bungkah) but also at places where such springs are absent. On 20 June the water by the village of Seked returned to its normal color. Late in 21 June the water by the other villages involved returned to its normal color. Scientists found neither dead weeds or algae nor gas bubbles associated with the fish kill. Cause of fish kill. Scientists from CVGHM found no evidence to conclude the fish kill was volcanically triggered nor did they mention it portending eruptive activity. Rather, the scientists noted the comparatively high diurnal-temperature difference during the onset of the dry season. As a result of these temperature differences, the lake water developed currents, which carried mud from the lake bottom to the surface. This was thought to correspond to the observed odors ('muddy smells') and color changes on the lake surface. In a broad sense, the currents and mud were thought to upset the lake's ecological balance in a manner toxic to the fish. Residents were advised to not consume dead fish from the incident, but fish that had survived were still considered fit for human consumption. Impactof fish kill. Many inhabitants around Lake Batur are fisherman by trade and it is estimated that the fish kill resulted in losses up to billions of Rupiah (1 billion Rupiah currently equivalent to ~ 120,000 US Dollars). The water of Lake Batur is also irrigated into surrounding farms. There is no official documentation on whether or not the recent events at Lake Batur have affected the neighboring agriculture. Reference. Sutawidjaja, I.S., 2009, Ignimbrite Analyses of Batur Caldera, Bali, based on 14C dating, Jurnal Geologi Indonesia, Vol. 4 No. 3, September 2009: 189-202 [http://www.bgl.esdm.go.id/dmdocuments/jurnal20090304.pdf]. CVGHM reported increased seismicity from Batur from September to 7 November and a significant increase in the number of volcanic earthquakes on 8 November. The Alert Level was raised to 2 (on a scale of 1-4). VSI reported that there were no major changes visible at Batur during 9-15 April. Thin steam plumes continued to rise above the volcano's crater. Seismographs recorded no shallow volcanic earthquakes, two deep volcanic earthquakes, two small explosion earthquakes, and 17 tectonic earthquakes. The volcano remained at Alert Level 2 (on a scale of 1-4). During 2-9 April, thin steam plumes were observed rising from Batur's crater. Seismographs recorded one deep volcanic earthquake, two shallow volcanic earthquakes, ten tectonic earthquakes, and five small explosion events. Batur is at Alert Level 2 (on a scale of 1-4). A thin white plume rose 2-10 m from the solfatara field in the N wall of the crater. Gases emerged with a weak hissing sound and had temperatures of 40-80°C in 27° air. Other solfataras emitted 2-5-m white plumes at 90-95°C. Seismic stations recorded one local and 26 distant tectonic events, and one volcanic earthquake in November. Beginning on 4 August, the daily number of A-type volcanic earthquakes increased to 14; two days later 125 events were registered. An eruption on 7 August from the E part of the summit, Batur Crater III, caused ashfall as far as ~6 km WSW (figure 1). Ash covered Kintamani on the caldera rim, one of Bali's famous tourist attractions. Incandescent lava fragments and black smoke were ejected to heights of 300 m. None of the larger lava fragments fell outside of the active crater. News reports indicated that the eruption generated 960 explosions through 11 August. Volcanic tremor recorded by the VSI on 13 August had a maximum amplitude of 4.5 mm, but was increasing. By 14 August, when lava reached the surface, the tremor amplitude was 23 mm. Figure 1. Map of the Batur caldera, showing hazard zones, selected towns, and extent of ashfall from the eruption that began on 7 Aug 1994. The inner caldera is not shown, but includes most of danger zones I and II. Courtesy of VSI. As of 18 August, no evacuations from the area around the . . . volcano had taken place. About 180,000 people live in Bangli Regency, but only ~500 live in what a spokesman called the "critical region." Batur was declared off-limits for climbers on 7 August, and local villagers were put on alert. An official at a monitoring center said tourists who evaded guards and climbed the mountain were taking large risks. According to press reports, the eruptions have not reduced the number of visitors to the popular resort island; Batur's crater attracts ~300 people every day. Many observe the volcanic activity from Kintamani, on the crater rim (figure 1). Information Contacts: VSI; AP; Reuters; UPI; ANS; D. Shackleford, Fullerton CA, USA. An . . . eruption . . . on 7 August . . . marked the first significant eruptive activity in 18 years. According to a 12 August Reuters news report, during 7-11 August Batur "spewed glowing ash and smoke more than 600 times." The Reuters report noted that a spokesman for the local governor's office said "the threat of a major volcanic blast on Indonesia's resort island of Bali appeared to lessen on Friday [12 August] after Mount Batur's activity slowed." The news report also quoted Wimpy Tjetjep (VSI): "The probability that there will be a big and destructive eruption is small." Information Contacts: W. Tjetjep, VSI; Reuters. During the first week of July, Batur continuously emitted a gray plume 25-300 m above the crater. Observers saw incandescent material frequently ejected. Two episodes of tremor with amplitudes of 0.3-24 mm were recorded. Intermittent explosive activity has continued since July 1999 (BGVN 24:06). The following report covers the periods of August-September 1999, February-June 2000, and August-September 2000. Reports were not available for the interim periods. 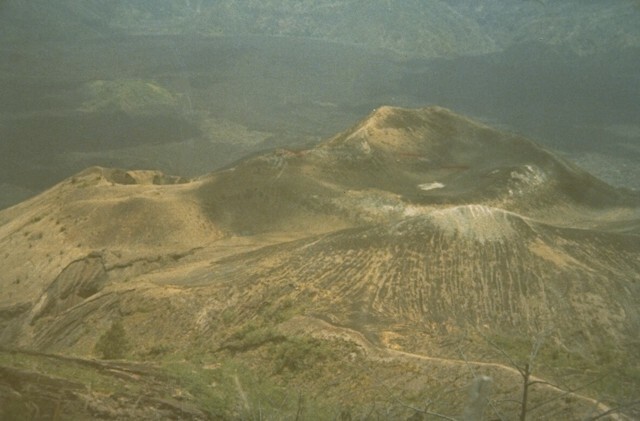 However, there was no activity on 20 July 2000 (figure 2) when participants attending the IAVCEI General Assembly visited the caldera (see Sutawidjaja, 2000). Figure 2. 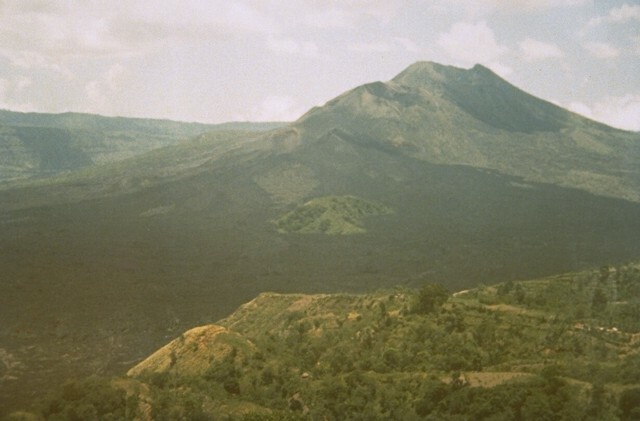 Photograph of the active cone at Batur, 20 July 2000. View is looking NE from Penelokan on the caldera rim. Courtesy of Edward Venzke, SI. In August 1999, Batur Post Observatory (BPO) observed frequent ash emissions and small explosions. Ash eruptions varied in height from 5 to 150 m above the volcano's crater rim. Some explosive events were accompanied by ejection of lava; the material rose 10-25 m, and incandescence could be observed at night. Explosion earthquakes dominated seismicity, which increased relative to the previous month. Frequent rumbling of varying intensity could be heard in the vicinity of Batur. During September, ash ejection increased in height, ranging from 25 to 250 m. Incandescent material continued to erupt from the crater. Seismicity continued to increase; seismographs recorded explosion earthquakes with amplitudes of 2-28 mm. Ash emission, lava ejection, and mild explosions occurred during February 2000. Ash rose 25-250 m above the summit. Ejection of molten material accompanied some explosions. Rumbling could be heard frequently around the volcano. Overall seismicity was lower than in September 1999; fewer explosion earthquakes and slightly more shallow volcanic (B-type) earthquakes occurred. In the middle of the month, a gray ash plume rose up to 300 m above the summit. Ejected material fell up to 50 m from the center of the crater. By the end of February, ash emissions rose 10-50 m above the summit. Explosion frequency and intensity decreased. Low-density, white ash-and-gas emissions rose up to 75 m in early March. In mid-March the ash plume rose 10-25 m. Audible rumbling ceased, and seismicity decreased substantially. On 22-23 March, a large explosion issued from the crater; ejecta were sent 200 m above the rim and rained back down within the crater. Seismicity increased along with the frequency of explosion earthquakes. Explosions and ash emissions continued into April, when ash and explosion debris reached up to 300 m in height, and rumbling resumed. Seismicity decreased by the end of the month. By early May, emission had decreased to a low-density, white ash-and-gas plume and rose 5-25 m above the crater rim. Rumbling ceased. Similar emissions and seismicity remained through the end of June. During August-September, a low-density, white plume rose up to 10 m above the crater rim, and seismicity maintained relatively low levels. Reference. Sutawidjaja, Igan S., 2000, A guide to the geological phenomena of Batur Caldera, Bali, Indonesia: Fieldtrip guide prepared for the IAVCEI General Assembly, Bali, Indonesia, 33 p.
The Center of Volcanology and Geological Hazard Mitigation (CVGHM) reported that seismicity at Batur (figure 3) increased from September 2009 to 7 November 2009, and the number of earthquakes increased significantly on 8 November (table 3). During this period, sulfurous plumes were ejected from the craters. The Alert Level was raised to 2 (on a scale of 1-4). This seismic activity was the first noted at Batur since 2001, when a series of mild earthquakes occurred (BGVN 26:09). Figure 3. Panorama of Batur caldera showing the ~ 7-km-long lake in the SE part of the caldera along with the cental topographic high composed of intracaldera cones. Copyrighted photo courtesy of "tropicaLiving" taken on 9 April 2008. Table 3. Number of different types of earthquakes registered at Batur between September 2009 and 8 November 2009. *Through 1830 local time on 8 November. Data from CVGHM. Information Contacts: Center of Volcanology and Geological Hazard Mitigation (CVGHM), Jalan Diponegoro 57, Bandung 40122, Indonesia (URL: http://vsi.esdm.go.id/); tropicaLiving (URL: http://www.flickr.com/photos/tropicaliving/). The historically active Batur is located at the center of two concentric calderas NW of Agung volcano. The outer 10 x 13.5 km wide caldera was formed during eruption of the Bali (or Ubud) Ignimbrite about 29,300 years ago and now contains a caldera lake on its SE side, opposite the satellitic Gunung Abang cone, the topographic high of the complex. The inner 6.4 x 9.4 km wide caldera was formed about 20,150 years ago during eruption of the Gunungkawi Ignimbrite. The SE wall of the inner caldera lies beneath Lake Batur; Batur cone has been constructed within the inner caldera to a height above the outer caldera rim. The Batur stratovolcano has produced vents over much of the inner caldera, but a NE-SW fissure system has localized the Batur I, II, and III craters along the summit ridge. Historical eruptions have been characterized by mild-to-moderate explosive activity sometimes accompanied by lava emission. Basaltic lava flows from both summit and flank vents have reached the caldera floor and the shores of Lake Batur in historical time. This volcano is located within the Batur, a UNESCO Global Geopark property. Reubi O, Nicholls I A, 2004. Variability in eruptive dynamics associated with caldera collapse: an example from two successive eruptions at Batur volcanic field, Bali, Indonesia. Bull Volcanol, 66: 134-148. Stehn C E, 1928. 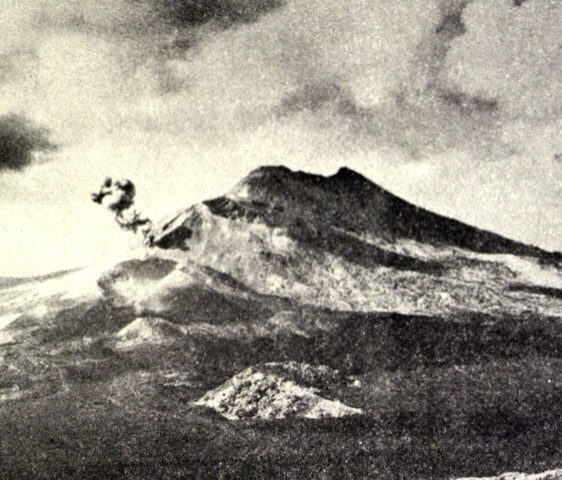 Volcanological work in the Dutch East Indies during 1923-1926. Proc 3rd Pacific Sci Cong, 1: 718-734. Sutawidjaja I S, 2000. A guide to the geological phenomena of Batura caldera, Bali, Indonesia. IAVCEI General Assembly, Bali 2000 Excursion Guide, 33 p.
Sutawidjaja I S, Chaniago R, Kamal S, 1992. Geologic map of Batur caldera, Bali, Indonesia. Volc Surv Indonesia, 1:50,000. Wheller G E, 1986. Petrogenesis of Batur caldera, Bali, and the geochemistry of Sunda-Banda arc basalts. Unpublished PhD thesis, Univ Tasmania, 156 p.
Wheller G E, Varne R, 1986. Genesis of dacitic magmatism at Batur volcano, Bali, Indonesia: implications for the origins of stratovolcano calderas. J. Volcanol. Geotherm. Res., 28: 363-378. There is no Deformation History data available for Batur. There is no Emissions History data available for Batur. Batur volcano on the island of Bali was constructed within a 7.5-km-wide inner caldera whose SE margin is obscured beneath the foreground caldera lake, which fills part of the SE floor of an outer 10 x 13 km wide caldera. Batur stratovolcano was constructed as a result of eruptions along a NE-SW-trending line of vents. Historical lava flows have formed much of the far lake shore in this view. Most of the extensive dark lava flows in the foreground were erupted during 1963-64 from vents near the Batur III cone on the lower SW flank of Batur stratovolcano, viewed here from the village of Penelokan, on the southern rim of Batur's outer caldera. The lava flows reached the caldera floor and destroyed 16 houses at Tamansari village. The complex stratovolcano was constructed within a 7.5-km-wide inner caldera. Activity has been concentrated along the NE-SW-trending chain of cones and craters seen cutting across the summit. An aerial view overlooks Batur I, the summit crater of Batur volcano. Batur is a post-caldera stratovolcano constructed within the 7.5-km-wide Batur caldera. A chain of pyroclastic cones and craters was constructed along a NE-SW-trending line cutting through the summit. Historical eruptions have occurred from Batur I, Batur II, Batur III, and other flank cones. A small ash eruption from Batur III cone on the SW flank of Batur volcano was photographed from the southern rim of Batur caldera in 1972. An ash eruption on January 19 was accompanied by strong explosions. Continuous ashfall was recorded from January 28 to February 12, and minor ash eruptions also took place in March. Photo by Jayadi Hadikusumo, 1972 (published in Kusumadinata 1979, "Data Dasar Gunungapi Indonesia). Large Eruptions of Batur Information about large Quaternary eruptions (VEI >= 4) is cataloged in the Large Magnitude Explosive Volcanic Eruptions (LaMEVE) database of the Volcano Global Risk Identification and Analysis Project (VOGRIPA).